At the request of a dear friend of mine, I’m going write a post today that I hope will help some aspiring writers out there, who might be in their beginning stages or want to know how in the world an author goes about their craft, and have it come out so perfect. Well… I’ll tell you. And it’s not sitting down at a chair and banging out a novel on a typewriter in one sitting. It’s sitting down at that chair possibly several times. 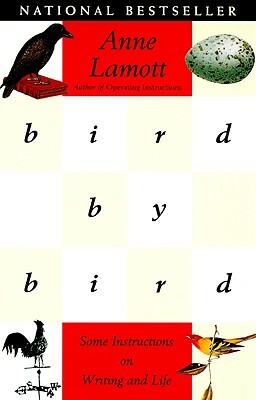 I consider Anne Lamott’s Bird by Bird one of the best Christmas gifts I ever received. I got it years ago as a teenager, horrified and excited by the author’s witty voice (though, “witty” is really an understatement) and her thoughts about writing, all packed within entertaining anecdotes. Yet the chapter that has stuck with me the most is her chapter on rough drafts. Awful rough drafts. Deplorable rough drafts. Jesus-Christ-I-am-sure-I-have-sinned rough drafts. Because, let’s face it. We all go through them. Some of us who are lucky enough get rough drafts close to their final drafts with minor cuts and blemishes to stitch up. People tend to look at successful writers, writers who are getting their books published and maybe even doing well financially, and think that they sit down at their desks every morning feeling like a million dollars, feeling great about who they are and how much talent they have and what a great story they have to tell; that they take in a few deep breaths, push back their sleeves, roll their necks a few times to get all the cricks out, and dive in, typing fully formed passages as fast as a court reporter. But this is just the fantasy of the uninitiated (21). On a rational level, I hate to compare writing a novel to raising a child, but I’m to be an English major, and even Anne Lamott refers to the rough draft as a “child’s draft.” I can’t resist metaphors, no matter how devilish and elusive they can be; I’m trained to analyze them and use them. So I’ll stick with it. Writing a rough draft should be like watching a toddler finger paint. It will be messy, but you’ll let them do it, because you know that messiness simply comes with the job, and that in a few years, they’ll be holding brushes, painting banners for their high school dances. It’s the time in your writing where you have the most freedom, because no one will see the Jesus-Christ-what-have-I-done awful bits. They’ll be gone once you’ve informed your novel of maturer things like plot, structure, tension, an active protagonist, setting, etc. And if you try to do that too early and write too perfectly from the very get-go, you will lose the childlike innocence and creativity that you wished you had writing the draft in the first place. So, the best thing to do is to write it. Write the rough draft. Don’t care what other people think. No one wants to read a baby novel. They’ll think it’s cute and interesting, but they won’t take you seriously. They’ll wonder why you’re selling a baby, and putting it out into the cold, cruel world. And somewhere down the line of letting your novel roam about, you might find a part of it you want to use later. I know I have with my drafts before, but the only way to know is if you write the thing. And once it’s written, that’s when you sit down at the chair again, with your red pencils or highlighters, and mark it up. But above all, don’t be intimidated by other successful writers. Once, they were just like you, writing draft after draft and getting better at the craft. Don’t be afraid of your own imagination. Let it surprise you. Let it excite you. Let it scare you. Let you and the first draft be yourselves. Or that second draft, if you think it’ll help to start over from a new perspective now that the vision you have for the story has changed over the course of writing the first draft. It happens. Trust me. Of course, you don’t want to stay in the draft phase forever, if you can. If it takes you fifty drafts to get to the novel you want, then have at it. But when conceiving that first draft and really getting into the deep heart of your ideas and mind, let it fly. Be free. You won’t get many chances to let it or you fly again, so why stop the fun so soon? Something to think about while you’re writing. Ahmahgah~ Thank you so much ❤ I'll do my best to post.